The learning curve is steep and the sheer volume of things you don’t know can seem overwhelming when you’re starting into something new – and apple growing is no different. To help new apple growers with their start in the industry, Ontario Apple Growers general manager Kelly Ciceran and Leslie Huffman, former Apple Specialist with the Ontario Ministry of Agriculture, Food and Rural Affairs, came up with the idea of forming a group for young growers – both young in age and young in terms of length of time in the industry. Gerbe Botden was part of the group’s first informal meeting one evening following the Ontario Apple Growers’ 2014 summer tour. He’s a second generation apple grower who farms with his parents in the Southern Georgian Bay area. “Most members are under the age of 40, which is fairly young in our industry,” Botden explains. Ian Parker of Wilmot Orchards near Newcastle was at that first meeting as well. He’s been in the apple industry for about five years, working alongside orchard owner Charles Stevens and orchard manager Robbie Montgomery. Brian Rideout, a director on the Ontario Apple Growers board, is not from a farming background. He’s passionate about apple growing, though, and started farming with his father-in-law, a fruit grower on the shores of Lake Erie, 18 years ago. “I don’t think you’re ever old to farming. I’m not a young grower but I still feel new and fresh to farming,” Rideout says. Following that first meeting, a consultant with the Agri-Food Management Institute helped the group stay connected during the first year. When that funding ended, Rideout became the chair of the group, tasked with keeping it going. Members try to meet face to face in conjunction with existing apple industry events, such as the Ontario Fruit and Vegetable Convention, the Ontario Apple Growers’ summer tour, the International Fruit Tree Association conference or the Great Lakes Fruit and Vegetable Expo. “When there’s a conference or a meeting, we know each other and can share information freely,” says Botden, adding that he wouldn’t normally approach people he didn’t know to seek their advice. 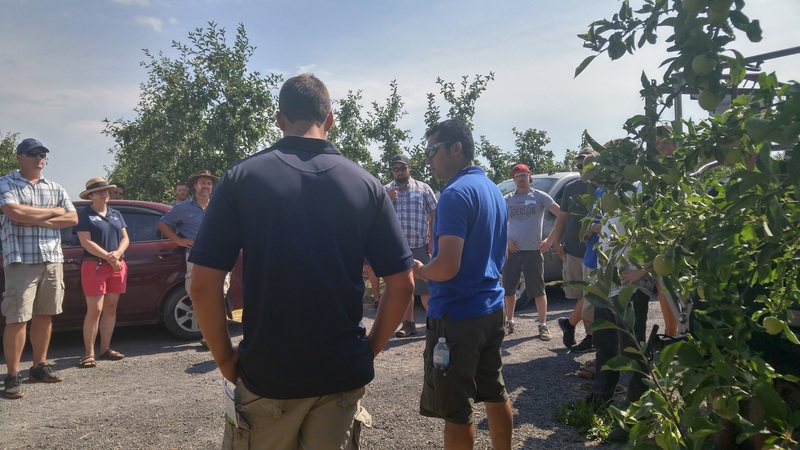 The group organized its own summer tour this year, with young growers in eastern Ontario hosting their colleagues at Wilmot Orchards, Algoma Orchards, and Watson Farms. The networking isn’t just limited to in-person encounters. A lot if it happens electronically through a What’s App group – and the ability for instant, constant communication with colleagues across the province is what members find particularly helpful. If somebody has something in their orchard they have a question about – like a bug they can’t identify – a quick snap posted to the group will usually yield an answer, adds Botden. All three agree the group, both electronically and in person, is an important way to strengthen the future of the Ontario apple industry. Group membership is approaching 50 people and includes industry partners representing input suppliers as well as government specialists with agronomic expertise.